Habit: Annual, perennial herb, glabrous to hairy. Stem: ascending, erect, or vine-like, often clinging by twining pedicels or branchlets. Leaf: proximal generally opposite, distal alternate, generally reduced distally on stem; veins pinnate. Inflorescence: cleistogamous or opening; raceme or flower 1 in axils. Flower: uppermost calyx lobe generally largest; corolla tube of opening flowers truncate or with rounded sac-like extension at base, lower lip base generally swollen, closing throat; stamens 4, generally included, staminode 0; style included, straight or curved, glabrous or glandular-puberulent to near tip, stigma inconspicuous. Fruit: ovoid to spheric; chambers 2, generally dehiscent by 1--2 pores near tip, lower chamber generally larger, upper occasionally indehiscent. Seed: many, generally with tubercles or netted ridges, winged or not. Species In Genus: 35 species: western North America, western Mediterranean. Etymology: (Greek: nose-like, from corolla shape) Note: North America taxa more closely related to Mohavea than to Mediterranean taxa; revision needed. Antirrhinum cyathiferum moved to Pseudorontium. Habit: Annual, glabrous except stem base, inflorescence hairy. Stem: erect but weak, often clinging to other plants or debris, 12--150 cm. Leaf: basal rosette occasionally present; petiole 0--3 cm, winged; blade < 11 cm, linear to lanceolate, tip acute to rounded. Inflorescence: raceme, terminal, flowers cleistogamous and opening; pedicels 1--5 mm, proximal-most generally to 13 mm, subtended by twining branchlets. Flower: calyx densely glandular hairy, hairs to 2.5 mm, lobes 3--6.4 mm, +- equal; corolla 9--12 mm, white to lavender; lower stamens becoming exserted. Fruit: 5--10 mm; upper chamber indehiscent. Seed: +- 1 mm, ovoid, black, netted and ridged. Chromosomes: n=15. 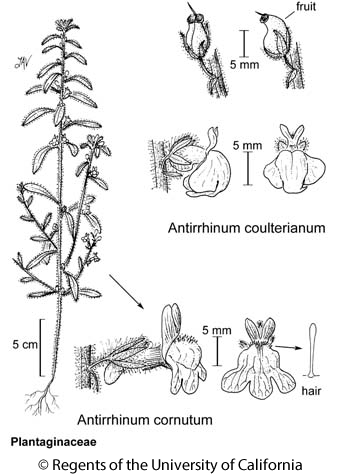 Citation for this treatment: Margriet Wetherwax & David M. Thompson 2012, Antirrhinum coulterianum, in Jepson Flora Project (eds.) Jepson eFlora, http://ucjeps.berkeley.edu/eflora/eflora_display.php?tid=13573, accessed on April 19, 2019.
s SCoRO, SW (exc ChI), nw edge DSon; Markers link to CCH specimen records. Yellow markers indicate records that may provide evidence for eFlora range revision or may have georeferencing or identification issues. Purple markers indicate specimens collected from a garden, greenhouse, or other non-wild location.